The biggest problem that the Nintendo Switch currently has is the influx of App Store games, which is seemingly endless. It’s not necessarily a problem with quality, it’s an issue with translating them to the big screen when you dock the console. Many games just don’t work as well, because the mindset comes from a touchscreen perspective. Tiny Troopers Joint Ops XL could have had this problem – the game introduces the player to the controls through the touchscreen primarily and that works fine enough, but as someone who has never really enjoyed the lack of tactile response, I needed to be able to use the Joy-Con. So thank goodness this is one of those games that shines when translated to the sticks. So, the Left Stick moves a little soldier or his squad on some missions, the Right Stick fires whichever direction you hold it and the shoulder buttons, when held down, enable throwing grenades or shooting rockets. It’s all very simple and it works just as well on the TV as it does on the move. Tiny Troopers Joint Ops XL is a surprisingly deep game, despite its shallow style. Each level takes place on a map and gives an objective, the idea is to shoot everything that moves – not locals or chickens – and then head to the helicopter waiting to pick you up, ending the level. Before deployment, difficulty levels can be chosen though they don’t seem to have too much effect on the gameplay and you can buy upgrades for your troopers. Upgrades are catch-all boosts – damage up, range up, extra armour – and once purchased they’re permanent. The interesting point here is that the points you earn throughout the missions convert to gold. So, exploration becomes integral. Finding dog tags, bombs that need diffusing, or bits of intel will reward you with points, these are then added to points for completion and any other bonuses you have. It’s a nice touch that the various modes all filter the points earned into a central pot. If you play the Spec-Ops mode or either of the Zombie modes, the points still pile up, meaning if you’re stuck on a mission – which is unlikely, the game isn’t that hard – you can grind some easier levels and boost your soldiers. Speaking of those modes, they are superficial add-ons but do add more content. Spec-Ops acts like a sequel to the main campaign and Zombies? Well, zombies pretty much re-skins everything with staggering monsters, but it’s a fun addition. And if the standard exploring and shooting gets boring, there’s a Zombie horde mode, too, which asks you to fight off waves of the dead until you instead, are dead. 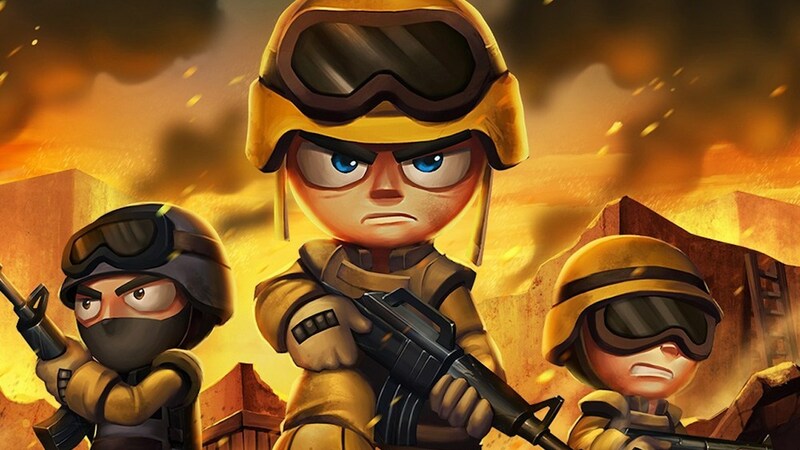 Tiny Troopers Joint Ops XL is one of those games which is perfectly fine. It isn’t a bad game and it isn’t going to blow the doors off of the barn. It’s an ideal game to burn ten minutes in between other experiences and there are some nice little moments throughout. Playing isn’t going to change your life or deliver any deep narratives, but if you want to blow stuff up and shoot mindlessly for a while, you could do a lot worse.